I never thought I’d be blogging about Dong Hai, but somehow I am. First of all, the place looks too ’80s neon to be taken seriously, and second of all, they not only serve Chinese food, but they also serve Thai food and Japanese food, including sushi. Thai food at a Chinese restaurant is weird, but I really draw the line at sushi. Just because a restaurant is run by Asian people, does not mean they know how to prepare sushi. In addition, except in a few regional cases, raw fish is not normally found in Chinese cuisine. You might as well go to Applebee’s and order a sushi platter. That said, you can understand my hesitation going to Dong Hai, but then Midtown Lunch got an email from a reader claiming the restaurant was even better than Szechuan Gourmet, and so I went, bravely where I had never gone before. Off the bat, looking at the menu, I knew Dong Hai wasn’t going to be better than Szechuan Gourmet. The menu was seriously lacking any real Szechuan dishes, unless you count menu items like Chicken Szechuan Style or Szechuan Beef Fillet. So instead I focused on the noodle soups, because it was, as usual, a freezing cold NY winter day (Not like the freakishly warm day it is today! WTF! ), and I needed something to warm up my bones. 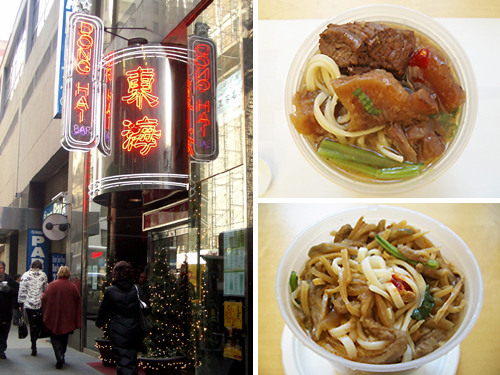 The first time I went, I ordered the Pickle Cabbage and Shredded Pork Noodle Soup ($6.00). The flat wheat noodles were flavorful and traveled well back to the office even though they didn’t separate the noodles from the soup. The pork was was also surprisingly tender and fresh tasting. Overall, the Pickle Cabbage and Shredded Pork Noodle Soup was really good, if a bit more Americanized. There wasn’t enough tsa tsai, Chinese pickles, and there were more bamboo shoots than necessary, but the soup was nevertheless tasty. One weird thing that did happen to me though was when I ordered the noodles, the woman at the counter charged me $7, but on the menu it was listed as $6. When I mentioned it, she was like, “Oh yeah?,” and then charged me $6.50. I assumed the fifty cents was tax. A bit weird, but I let it go. A few days later, the chill was getting to me again and I suggested Dong Hai when my coworker, Taiwai, suggested getting Chinese for lunch. He wasn’t thrilled at first, especially when he saw the menu and it said “You Ring, We Bring” on the front, but somehow I convinced him and we placed our orders. 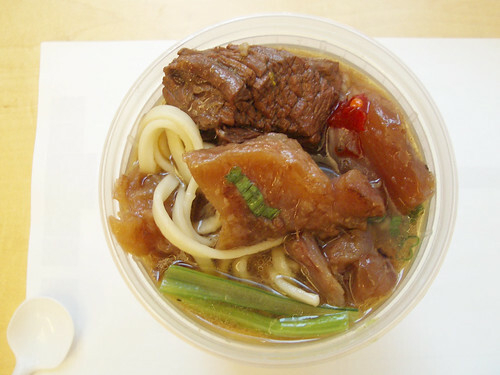 This time, I ordered the Beef Stew & Vegetable Noodle Soup ($8.15). Again, the noodle soup exceeded my expectations. The beef was really soft and shredded easily, as if it was cooked for a long time. A lot of Chinese restaurants don’t take the time to do this, since it’s very time consuming. There was also a lot of gelatinous tendons, which Iove. If you don’t like tendons, you may want to skip the Beef Stew as there was more tendons than beef, which is ideal for me, but probably won’t be for you. As for the soup, it was a little sweeter than I normally like, but not too sweet that I couldn’t handle it. 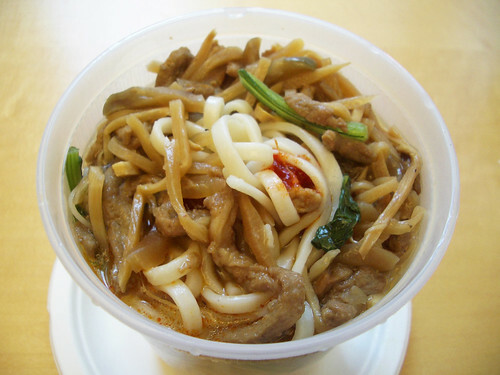 And again, it came with some nice flat wheat noodles. The only problem was, again, the strange calculations. I didn’t realize the discrepancy until I looked at the receipt today. On the menu, the Beef Stew Noodle Soup was $7 as was Taiwai’s order of Fish Fillet in Garlic Sauce (which he said was just average), but I was charged $8.15 and he was charged $8.70. I mean, is it just me, or is that just wrong? And it can’t be the tax, the difference is more than 15%. So, the noodle soups were really good both times, but will I be going back? I’m not sure about this one. Getting swindled gives me indigestion, no matter how good the food. I think I’ll be sticking to Hing Won. @Kenny If it was same amount each time, I would assume it was something like that, but each time it was wildly different. All I know, is something fishy is going on… something besides the sushi.